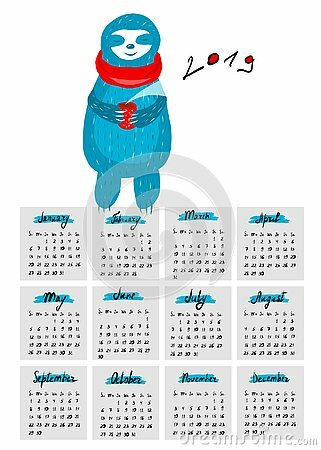 Calendar for 2019 with a nice sloth. Week starts with sunday. Green pig wishes you a lot of money in the new year! Happy New Year 2019 card Golden design. Eastern horoscope signs of the zodiac with the symbol of 2019 - the pig. Aries, Taurus, Gemini, Cancer, Leo, Virgo, Libra.